Vettel got penalised 2 years ago, I think he passed a car? That's the thing they don't want a driver to do something dangerous in the first place. Well at least we now know that the Verstopper sausages work. Stopped Max just fine! Was kind of hoping that Max would be right up there though. Would have been great entertainment watching Sebastian do a gut check about when and where to pass Max. Still it will be fun to watch Seb navigate his way around Ricciardo and Bottas. Wonder what great Kimi-ism reply on the radio will be when the call comes to let Vettel pass him. Kimi might be leading the race so Vettel might have to pass Hamilton first? You don't make them wait when the other sports out-draw you as F1 is trying to build their U.S. following. As for the "plenty of food to keep them busy" comment, is that get another dig at Americans? Last edited by Blake on Sun Oct 21, 2018 6:50 am, edited 1 time in total. That's a distinct possibility with Kimi starting on the Ultras and Lewis, Valtteri, Sebastian, and Daniel starting on the Supers. Still if Kimi is leading the race when Seb gets to him there will most certainly be a call from the pits for him to move over for Seb! ...won't there??? They might also use Kimi to push Lewis back towards Sebastian if they get a chance. Ocon doing a splendid job as always in being 'Best of the Rest' qualifier! Yes, apparently I've become a Leclerc fan without really noticing it. Oh well! Only reason I see is shortage of new Ultrasoft tyres. 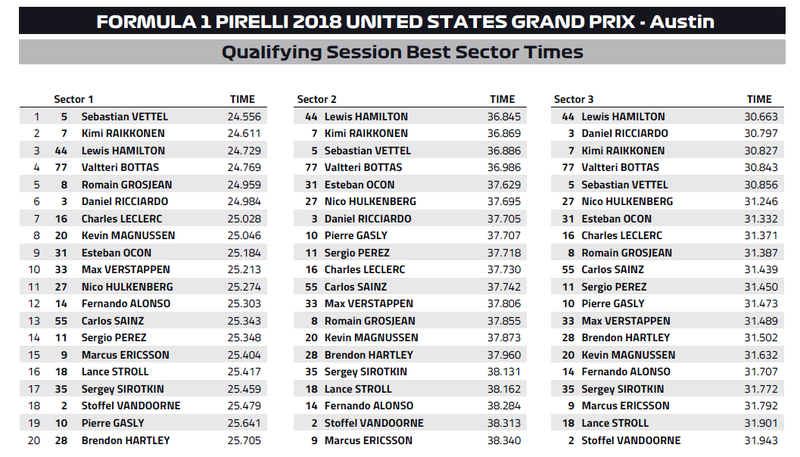 Checo & Ocon even did their 1st runs in Q3 on used ultras. Will Kimi allow him oast without a fight? Ferrari didn't make that call in Austra or ib Jaoan (albeit the gap was massive in Japan). If Hamilton retires from the race and Kimi is 1st with Seb second then perhaps they make that order. It doesn't mean he'll comply. They didn't swap positions in Japan so I don't see them doing it here if it's for the win. I'm not even sure Kimi would give up his final win anyway. Historically Ferrari have been much less reticent about using team orders than Mercedes, although this year Mercedes has used them more. Kimi is indeed something of a wild card and with his Ferrari career down to three races after this one, indeed might not take team orders to surrender to Sebastian. I think in talking about Kimi vs Seb here on strategy alone if this situation occurs Seb is not going to need the team orders as he is on the durable SS so going to go longer into the first stint, by virtue of that alone. The Bianchi accident is totally irrelevant to this. There is a benefit to driving as fast as you can under yellows in a race (where incidentally there is no speed limit). However under red flag in practice their is no advantage to be gained so drivers will naturally drive slowly. Just to point out as well - Speeding in the pitlane in a practice session only gets you a fine because you gain no competitive advantage for it. How can speeding in the pitlane be judged as less dangerous than driving well off the pace on a clear track with a good sight. Obviously not cus you got vettel doing ~180kmh on a wet track under red flag. Also your argument earlier was not against the penalty but against the rule its self - you're aguing against placing a speed limit on a red flagged track, its very strange. Vettel was driving way off the pace. Are you honestly saying it seemed dangerous to you? There's absolutely no need for a speed limit on red flag track. It's absolutely typical of F1 style over regulation. This is a bizarre position, honestly. When a red flag comes out the competitive session is instantly stopped. 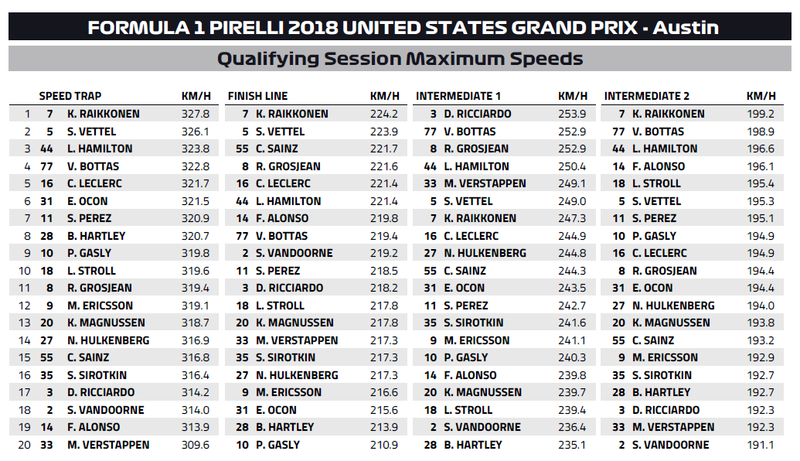 How does it seem unreasonable to you for there to be a speed limit on track when the competitive session is stopped due to some hazard on track? I usually respect your opinion, but I just can't see this one. It seems like you're so set on the idea of over-regulation that you're applying it to a case where the regulation makes perfect sense. I'd say a simple "don't drive in a dangerous manner" would do, no need to make it rigid by putting a number on it. On a VSC I can understand the need for a delta, if there's a competative advantage to be gained the drivers will push it so leaving wiggle room in the regulation is a bad idea. On a red flagged track however there's no competative advantage to driving quicker, by putting a number on it you end up with pointless penalties like the one here and Japan etc. Sure all of those penalties were correct since the drivers broke the regulation, but the only reason for the regulation is to stop dangerous driving and the drivers penalised weren't driving dangerously. I think in this situation since there's no competative advantage to be gained you could have a vague regulation that allows the stewards to penalise dangerous driving but also apply common sense and not be rigidly locked in to giving penalties for dangerous driving when the driving wasn't actually dangerous. Conversely, why is it unreasonable to expect a driver to drive at 90km/h after the red flag when it in no way disadvantages his race weekend? Vettel applied sustained acceleration TWICE after the red flag came out. There was no need to do so, and that's why he got the penalty. Agreed he shouldn't have risked getting the penalty. Doesn't mean the system is a good one though. Said it better than I would. This is exactly what I think. Having a rule that is unnecessary just means at some point you're going to have to penalise someone for something that caused no harm, and was never in danger of causing any harm what so ever. That does negatively effect the show. It's not so much unreasonable as unnecessary. F1 has enough rules drivers and teams can mess up on as it is without adding in more than is required. So how do you define "driving in a dangerous manner"? It would be up to the stewards and depend based on speed/location on the track/conditions/how close they are to the scene of the accident etc. 'Dangerous driving' is a judgement call type of thing, by putting a figure on it you potentially punish drivers who are driving safely and don't punish those driving dangerously. A driver at 100kph on the main straight at Mexico is driving safer than a driver doing 80kph through Monaco for example. Since the drivers have no incentive to break the rule I don't see it ever needing to be enforced but as it is in the regulations the stewards would have the power to penalise if it ever did happen. What's the purpose of doing so? To stop dangerous driving right? This year we have seen the rule give grid penalties, which are a general annoyance to fans, to drivers when they were not driving dangerously. The regulation as is doesn't do what it should do, even if it is relatively easy for the drivers to follow. I don't see what's baffling about that. It's pretty easy to follow the reasoning actually. I don't really get the whole annoyance at grid penalties, which probably has a lot to do with why I'm not bothered by the red flag speed limit. If people are sloppy and they break the rules, they get a penalty. But I think at this point it's clear that both positions have been laid out, everyone understands and disagrees, and we're not going to change any minds here.